You are here: Home Forum Home The 70's Disco-Fiber Newbie with an old boat. Newbie with an old boat. TOPIC:	Newbie with an old boat. In 1971 my uncle called my dad on the phone and said come look at my new boat. 46 years later I went to northern Indiana and rescued the old girl from a slow death in an old farmers barn. She is in incredible condition considering she has not moved in the past 17 years. 1971 Arrowglass Javelin I/O merc 120 hp sitting on the original Dilly tilt trailer. My uncle and his family named her Old Mustard. Welcome aboard. I think Old Mustard looks like a pretty nice rig! I am not the expert, but there are plenty on here if you have any specific questions. Great that you rescued the forgotten boat. 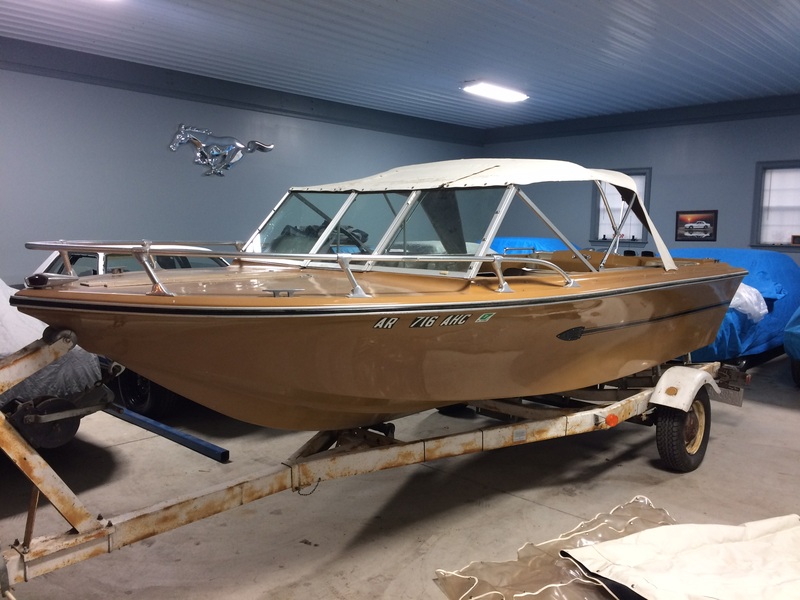 Nice looking boat, and it's fantastic that you saved her from deteriorating in a barn forgotten. It's great to have a boat or car that has family history, makes it all that much more special. Ditto Dr. Go. Nice shiny rig. I see in the background a nice mustang logo and some cars under wrap so I'm assuming you know more than an average person about motors. If that boat has been sitting so long than it would be prudent to go through that motor, seals, pumps etc. Shouldn't even turn it over without at least squirting oil in the cylinders, the lower drive probably has dried seals and water impeller also. thanks for the nice comments guys. I have spent the last week or so doing some cosmetic things. I gave her a good bath inside and out and them buffed the boat with a good rubbing compound to remove oxidation. Then I buffed her with a finish polish and lastly put a good coat of wax on. She shines like a new penny now. I am waiting on my cousin to find the keys for the ignition switch. She says she has them "somewhere". I may end up having to swap out the ignition switch if she doesn't hurry up and find them. I took off all the railings, and other chrome accessories and will polish them ll before re installing them. My upholstery guy that works on my car interiors for me is also a great boat top guy so I have going to have him make me a new set of side curtains and put all new stainless snaps back on the boat in the original snap holes. I am going to install a couple of flush mount cup holders and a 12 volt receptacle for a phone charger as well. The interior seats and other vinyl trim is very nice and will not need recovered. The floor is a solid as it was when new and the floor covering is still in great condition as well. If all goes well I plan on building a teak swim platform to install across the back above the outdrive. I need to get the boat running and in the water to determine where the swim platform will go first though. I bought three new tires for the trailer and plan on sandblasting the old paint and rusty scale off, spraying the trailer with a good rust prohibiting product and then new paint. I actually found a set of like new, mint Dilly hub caps on eBay for 40.00 lol. Mechanically.........I want to be very careful when cranking the engine for sure. It WAS winterized properly when put away but it has sat for about 18 years without running. I REALLY need to find manual of some sorts to study regarding maintenance items that I need to inspect. I have a local marine mechanic friend of mine that says he can change the water pump impeller for me. I also plan on changing all fluids, inspecting the fuel tank for rust, installing a new fuel filter, installing a new fuel line (very stiff) and scoping the cylinders with a camera as well to see the condition. I will spray something inside the cylinders as well. Another suggestion I was given was to take the coil wire off and crank the engine to pump up the lifters and get oil to everything before trying to start it. The boat is currently sitting in the shop and I have the heat on 65 degrees so it will be good and warm when I first try to crank the motor. One of my fears is the carburetor leaking fuel from every gasket....etc. I realize I may need to rebuild it as well. Any other advice reference initial starting of this engine would be appreciated. I know my uncle took VERY good care of this boat but for the last 18 years nothing has moved.. The tires still had 6 pounds of air.....but the battery was killed lol. If the boat starts and runs with no issues I will be doing a complete tuneup also. I would imagine it could use it. One question I have is on the power trim. When I got the boat out of the barn I could not get the power trim to raise the outdrive. I had no key though. Does the key need to be in the on position normally to use the power trim on these old boats? I ended up and removed the trim cylinders on each side and just held it up with a strap until I got it home. I've only worked on a couple of these Mercs and memory is short. I'm trying to remember things about the older trim and I believe they use straight 10 motor oil in the reservoir. Easy information to find online. As long as you can hear the pump motor run it should be raising and lowering with the key on or not. There are solenoids that control which way the pump should run and they might need replacing. If it's a straight six motor it's really easy to remove the valve cover and oil up the lifters and seals before turning it over. I am pretty sure it I the 4 cylinder 253 cu chevy 4 cylinder. I believe it would probably be easy to do it manually as well. I am going to try and find a service manual for it. just an update. With just a tuneup and some fresh fuel the engine started and runs like a sewing machine. I put a new water pump impeller in and took the boat to the lake. Runs like a new one. Literally......no leaks, knocks, hiccups, or issues of any kind. Totally amazed. ''I put new bearings, races and tires on the trailer and am going to repaint the trailer and get some new side curtains made, then it is good to go. I have no clue what I am going to do with this boat now...lol.